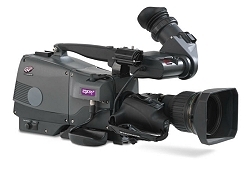 NEP Europe standardizes on Grass Valley 4K cameras for new mobile units. Montreal, November 2016: NEP Europe has announced its commitment to purchase all Grass Valley native 4K cameras for its new trucks that are currently under construction. NEP Europe has been relying on cameras from Grass Valley for years, with more than 600 cameras purchased and used for a wide variety of production projects during that time. When designing the newest trucks that will be joining the fleet over the next six months, leaders at NEP Europe concluded that only the new LDX 86N cameras from Grass Valley will provide the best performance and value for the increasingly popular UHD production its clients are demanding. "We won't be switching to UHD production overnight, but it's clear that the market is moving that way," observed Paul Henriksen, president of NEP Broadcast Services Europe. "By making this decision now and equipping our new trucks with the best 4K cameras on the market, we are ready to offer the capability as our customers demand it. Also, the LDX 86N offers outstanding HD image performance, so it fits our production needs today very well." NEP Europe's long-term plans include utilizing Grass Valley's 4K and IP compatible K-Frame switcher video processing engines and Belden cable in its mobile fleet, with some of its projects beginning to rely on an IP infrastructure for improved speed and efficiency. The company already has commitments to provide UHD production for customers in Germany and Switzerland and expects more of its work to transition from HD to UHD with the five new OB vans, all with Karrera 3-stripe control surfaces. "NEP Europe is a real pioneer in the market, putting everything in place to take advantage of the new opportunities for UHD production," noted Jan-Pieter van Welsem, vice president of sales and marketing, EMEA, Grass Valley. "We've worked together for years, and by staying on the leading edge of technology, we are able to provide them with solutions that fuel their growth while paving the way for change. Before we know it, UHD will be the default format for a majority of programming."